I love eggs. I eat them most days for breakfast, but until recently (last six months or so) I used to fry them, which isn’t really good for me even if I do use frylite or vegetable oil instead of butter or lard. Little silicone egg poachers! 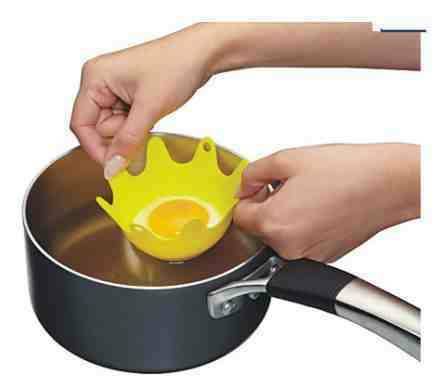 I’m a total convert, I cook all my eggs this way now, I’ve practically given up on fried. So much better for me because they use absolutely no fat at all. They are also really easy to use. Half fill a small saucepan with boiling water, crack the eggs into the poachers and pop them in the pan. I’ve now started to spoon a couple of tablespoons of boiling water over the tops of the eggs to make sure they don’t dry out. Put the lid on and cook for about 6-7 minutes and they’re ready to go. I eat these for breakfast a lot because they’re so quick and easy to cook, I don’t need to give them my constant attention like fried eggs and they don’t make much of a mess either. A quick rinse of the saucepan and a quick wash of the silicone with a sponge pad and a bit of washing up liquid and they can be left to drain. Mine were £1 for a packet of two and they have been an excellent investment – definitely something to look into if you eat a lot of eggs! This entry was posted in Busy Life Recipes, Updates and tagged alternative to fried food, breakfast food, Busy Life Recipes, egg poachers, poached eggs, silicone cooking equipment.